Yes I made the nuggets. I couldn’t let yesterday’s corn dog oil go to waste. I nixed the rice crackers from previous attempts. I think the nuts in the crackers were giving them an odd aftertaste. They came out really pretty unlike before. they were light and fluffy and tasted pretty good. Now I just need to figure out what kind of spices to add to this mix so they aren’t quite so bland. I have to cater to both ends of the taste buds with the little guys. I simultaneously (while being careful not to contaminate) made macaroni (quinoa and corn elbows) with homemade Velveeta cheese sauce. The kids loved dinner and I had plenty of both to freeze for later meals. Today was J’s monthly Psychiatrist appt. Since he has had so much anxiety about the bus and it has manifested as aggression, we decided to up one of his meds. We also made the decision to start him on Melatonin. He has been having a really hard time getting to sleep and then staying asleep for a while now. So far, so good. He didn’t get out of bed once he got in tonight. Lately he has been in and out for up to 2 hours past bed time. then he gets up in the middle of the night and changes where he sleeps (moves to a random couch in the house.) Then to top off the lack of sleep, he has been waking up 1-2 hours earlier than normal. I decided to go with the time release melatonin…..I’ll let you know the results of day one tomorrow. Too early to tell right now. Rachel Ray, I am not. Friday School Safety was parked outside my house when I went to put J on the bus. He got on with no problems but they said that if he had violent outbursts again then they could refuse to transport him. His teacher got on the phone that afternoon to try and work things out. She found out that they came to my house with out following protocol and that no they can not refuse transportation, they have to find an alternative. He had a pretty good day at school. We went to a friend’s house to have dinner and play. We stayed late and the boys did very well. Little J was a little bit of an instigator with a boy younger than him, but other than that we all had fun. Saturday I took the kids to the Earth Day Festival and Parade. Since it was an Earth Day themed parade and every one was either on foot, wagon, or bike the kids were not impressed. We went around to the different booths and left with some fun free stuff including 3 “pots” with seeds to grow. So now we are starting a garden. Sunday was pretty much as usual. J had a few scuffles with his least favorite 4 year old girl. I went to a passover Seder/service. Monday was HORRIBLE. He got on the bus just fine and then lost it when he was at school. His report chart had all negative items on it and he even punched his favorite teacher. That night hubby and I went on a date. We had Miss M, the boys’ favorite babysitter come over to stay with them. I left her with the new Bob’s Red Mill Pizza Crust Mix. She loves to cook and bake so I knew it was in capable hands. When we got home, J had eaten 2 pieces and Little J was working on his one piece. He got to playing and when it was bed time he realized he was still hungry so he decided to squirrel it away in his fists and take it to bed…..hello crumbs in the morning! He asked for another piece for lunch on Tuesday. I froze the rest. Tuesday was a good day. J got on the buss with no problems. What was an accident on Friday, we have turned into a pattern. He is now playing in the house until the bus is on the street. Then I rush him to put on his bag and send him out the door just as the bus is opening the doors. I stay on the front porch and he takes a small toy in his hands. By rushing him out the door instead of playing outside for 5-15 minutes he doesn’t have time to think about the separation. He is focused on not being late. and by having a toy in his hands, the Aid engages him in a conversation about his toy and gets him to come up the steps to talk about it. Tuesday night we went to the county fair for discount rides night. The boys had a blast. Their favorite ride was the kiddie roller coaster. We played for almost 2 hours. Tonight I knew that a mom of a child in my Bible class was having cupcakes for her b-day. I also knew that the mom was inviting the brother’s class, which is where J is. 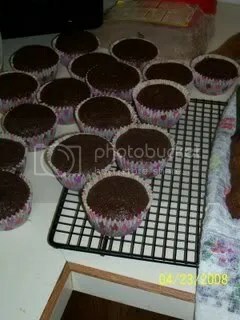 So I used the Bob’s Red Mill recipe for gluten free brownie cake using the brownie mix to make cupcakes. I only took one for class and the mom of the b-day girl put some whipped topping on it with sprinkle so it was like the rest. He loved it. I bagged up the rest to freeze. I plan on bringing them out for other party type events when I don’t want them to be left out of dessert. On the way home they both decided that they wanted Corn Dogs, known in our house as “hot dog on a stick.” I really don’t know why they decided on this. they haven’t had them in over a month. Funny thing is, I’ve been contemplating making them for 2 weeks now. I bought Bob’s Red Mill GF Cornbread Mix anticipating this recipe. Then I researched recipes on-line to see how the rest of the world makes corn dogs at home. Then I called my mom to ask her advice. Then I just sat on the ingredients. A while ago I saw an episode of Rachel Ray’s talk show where she was making summer favorites. One of her recipes was corn dogs. 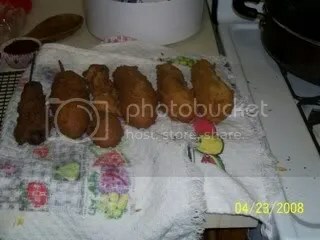 I watched her thinking, “That is just TOO much work!” So I thought about that and fretted that my corn dogs would look lumpy like hers and the kids would reject them because they didn’t look store bought. I accidentally saw an episode of “Unwrapped” on the Food Network that featured fried foods. One of the items was corn dogs of course, how was I ever going to live up to that??? Tonight I knew I was going to have to bite the bullet. And there was no way I was baking them like Rachel Ray because they were hungry NOW. So I modified the directions on the back of the mix by leaving out 1/4 cup of milk and added 2 Tbsp of honey. I don’t have a fryer so I heated up vegetable oil in a large deep skillet. I stuck Popsicle sticks in the hot dogs after patting them dry on paper towels. (I probably gave my kids lead poisoning b/c the only sticks I had were the colored ones!) Then I tried numerous ways of getting the better on the dog. One of the tricks I read on-line, put the batter in a tall skinny vessel and dip the dog, was a total flop. Sticking it in the batter bowl and then spooning the batter on worked the best. then I fried them up. The first couple were really dark b/c the oil got too hot, but the rest cae out nice. The boys devoured them. Little J even asked for seconds! So of course I bagged the rest and stuck them in the freezer. Tomorrow I am going to get another package of dogs because I still had batter left over. I think I am going to have to commit to 2 days a week of wheat-free bulk cooking and freezing. Tommorrow I will probably make a 3rd attempt at chicken nuggets and a 1st try at pancakes. I’ll top off the night with macaroni and cheese. Disclaimer: I have not been paid by Bob’s Red Mill nor did they even ask me to write reviews. I just use the name brands so that you know exactly what we are doing to make our wheat free diet work. Different brands are not all created equal. J is a button pusher and a limit tester. He will test authority figures until they lay down the law. His old bus driver and aid got this about him and used a firm hand in getting him on the bus. He would act stubborn going up the 1st 2 steps, then they would shut the door, take him by the arm and lead him to his seat. Everything was fine after that, I never got a bad report and I never had to get on the bus to help get him seated. He got a new driver and aid, and they broke up the bus routes so he is not with all the same kids either. All of these changes were a lot for his system. Top it off with the fact that the driver and aid are afraid to touch him and want him to go to his seat all on his own and we have a recipe for disaster. J has severe separation anxiety. He’s been doing great lately with a certain babysitter and he does great once he is at school, but getting him on the bus or dropping him off at the gate has always been a trial. However, his mood after riding the bus has always been better than dropping him off. Twice this week the driver has asked me to get on the bus to put him in his seat. Twice this week he has screamed and kicked and hit all the way to school. And twice this week he has had horrible days at school, complete with hitting students and teachers. Apparently Monday was not bad because it was Monday, but because I had to get on the bus and that is a deviation from routine. I am really frustrated with how these people have decided to handle him. I have told them that he needs a hands on approach. The aid on Monday said, “well as long as I have your permission.” Today was a different aid and they gave me crap about not wanting to pull his arm out of the socket. J now knows that they are going to do nothing. So he is going to fight tooth and nail not to get on that bus. And his days are going to be completely disrupted. His teacher called me today and we talked for a while. She said that this isn’t the 1st time that one of her kids has had problems with this driver. She is going to call the school social worker and see if they can pull strings with transportation to get him back on his old bus. She said that while she was holding him and trying to calm him after he went on a random hitting spree, she was trying to get him to express why he was so angry. She finally asked him, “If you can ride your old bus would you be happy again?” She said he totally relaxed and his attitude changed and he said, “yes that would make me happy.” Of course since his whole morning was totally off, when they transitioned to the next activity, he went wild again. I think at any other school he would have been written up, sent to the office, had me pick him up, etc. I applaud his teachers for sticking it out with him and not letting him get away with stuff. I also applaud them for being swift advocates for him. I told her that tomorrow, if he won’t get on the bus then I will drive him to school. Me dropping him off has fewer repercussions than him having a bad bus ride. So we will see. Last Monday I wrote about J having a bad time at school, and on Tuesday things were better. We have repeated the pattern this week as well, but the weekends and routines were different from each other. And last weekend he didn’t miss any medicine doses. So it must just be Mondays. Maybe more later. What I really popped in to tell you was that the Bob’s Red Mill representative really came through. I received my “sample” box yesterday and inside was 4 full size packages of 4 different mixes, for a total of 16 bags. I plan on sharing the wealth with others in my mom’s groups who are doing restricted diets. When I was exploring the Bob’s Red Mill site, I found a wonderful recipe resource. Some of the recipes call for using the mixes to make them in to other things. So for the mixes that I have already tried in their original form, I will be experimenting with the alternative recipes. I don’t think I’ve ever been this excited about baking before. This weekend before my package arrived, I made the Arrowhead MillsGluten Free Brownies. I followed the instructions and they taste great. The kids were really happy to finally be allowed to have a dessert that wasn’t rice cakes or pudding. The only thing I would do differently next time would be to put it in a smaller pan. The recipe called for a 9×13, but they came out thinner than I like. If you do, your wonderful fun filled weekend will come crashing down on Monday. Don’t worry I went to the pharmacy and picked up the prescription so that no ore doses were missed. For J not me. Now if only I can convince him to go to sleep and stay asleep for the whole night tonight. I’ll fill you in on the weekend when I am feeling a little less cranky. Hubby took the boys to the park this morning. I actually managed to make some headway in the kitchen, cleaning up that is. My counters had been taken over, it was sad really. But they came home early due to both of them being “naughty.” So I didn’t get finished. J came home with a new chart in his folder. It had 4 boxes in a row and 4 rows. The boxes were labeled “no hitting,” “sat in circle,” “followed directions,” “chewed on stick.” He had a red smiley star in each box. 🙂 I know “chewed on stick” is not something you would find on every child’s send home report, but it is important for us. J has been going through a phase for about 2-3 months where he was chewing on his shirt, then it escalated to his shoes, and toys. So his teachers have replaced all of those with some sort of nubby stick. (Side track, we went to our 1st Occupational Therapy session yesterday and the OT wants to try some oral stimulation to try and help him get enough sensory input so that he doesn’t feel the need for chewing. Next week he is going to send us home with some sort of vibrating mouth thing. I’ll keep you updated.) So his teachers followed through and he followed through and now we have a chart with 4 happy stars. Hopefully there will be many more. After he got home from school, hubby and I went to the movies and he stayed home with his favorite sitter Miss M. It was technically nap/quiet time. So I had her put Little J down for sleep and said that J could stay awake if he laid down and watched a movie. I came home to happiness. He got to have Miss M all to himself and a movie to boot. Then after Little J woke up and we had something that resembled dinner, we went to Chuck E Cheese for some good family fun. We had some great coupons and the boys each had an email for free b-day tokens not yet expired. As a family we blew through about 150 tokens! We had a nice night and no one got in any trouble. they waited their turns, gave up games to people waiting in lines, climbed in the tunnels w/o pushing. Basically they redeemed themselves for their behavior at the park in the morning. I was tired yesterday, so here is the post I intended to write. We were busy and there were no naps for me and J. In the morning we were suppose to go to a kids yoga story circle but the teacher never showed up. I took J by him self and left Little J at home with hubby since he was off. I explained to Little J that he gets to do stuff with me all week on his own so it was J’s turn. He was mad, but I left so I wasn’t the one who had to deal with it. So after we waited about 20 minutes for the no-show teacher with some friends from our military mom’s group, we left and went to the children’s museum. He stayed very busy and did well with all the extra kids there due to a field trip. We got home with about an hour to eat and relax before leaving again. Today was a better day at school. There was no hitting. J went with strict instructions that if he hit anyone then he would lose computer time tonight (his current obsession.) I picked him up from school today so that I could have some face time with his teachers. We decided together that they will send home a simple chart in his folder each day. A smiley sticker means a good day, no sticker is a bad day. There will be separate column for hitting tally marks. I will also continue to pick him up 1-2 times a week. I plan to compare the behavior chart to our playdate/park date attendence calendar at the end of the month to see if there is any correlations. We are making some big leaps this week, which could be the cause of some of the outbursts…hmmmmm. The verdict is still out. Today I added one thick slice of frozen Bob’s Red Mill wonderful homemade bread from the end of the loaf. I put it in the blender and mixed it with the crackers and flour. They looked, felt and tasted much better this time around. Next time I will either leave out the crackers or use a different type because they are leaving a nutty aftertaste that little J doesn’t like. He will take a bite out of each nugget but never finish one. J’s teacher told me at his IEP meeting a few weeks ago that he was hitting them sometimes when he got upset. So after that I started asking when he got home, in addition to all the other specific questions I normally ask, “Did you get in any trouble today?” For the past few days of school he has answered “yes.” When I ask him what he got in trouble for he tells me hitting. Sometimes it is only one person and sometimes more. Today he listed 2 teachers and one student. Last week when I asked the “why?” question, twice he told me it was because he was trying to take the jump rope away and they wouldn’t let him. Today he couldn’t tell me. Also when I ask, “Is hitting a nice thing to do?” he begins with telling me “yes.” He also tells me this when he gets in trouble for hitting Little J. While all of this lashing out is concerning to me, the most troubling thing is that in past week I haven’t heard anything from his teachers. If I wasn’t asking the questions of him, and him not knowing how to lie effectively, I wouldn’t know that this was happening. His teachers obviously love him very much. They always have wonderful things to say about him. On the occasion that I do pick him up from school, they will give me an honest report of the day and/or the day before but should I be hearing about every instance? Are they giving him too much leeway by not telling me? Should I just let them handle what happens in school, at school? I know that they are busy, excessively busy. Should I be expecting this much communication? Maybe I should just pick him up from school more often. On a related note…I take J to a psychiatrist for medications and we will be starting OT this week. When we go to the Psych, I do most or all of the talking. It is mostly about medication management. We haven’t changed anything in a few months, but I thought we were maintaining the status quo, obviously not if he is in trouble daily for hitting and being aggressive at school. so we may need to change something. BUT, should he being someone else to “talk” about his anger? If he doesn’t always understand the “W” questions would this even help? Thoughts? Ideas? J has poor fine motor skills. He can’t button or snap his blue jeans. He can’t button polo shirts and has a hard time unbuttoning them too. For those of you following our clothing obsessions, 2 of his new pajamas that were made for him by my mom’s friend have 4 snaps down the front of the shirt. The first set that we got him to wear a few months ago frustrated him to the point where he won’t even try to snap them. I introduced the 2nd snapping set yesterday. He started out with the top snap. After a few false starts, dropping one side or the other while trying to get it lined up, he snapped it together. Awesome! The second one was a breeze. The third one gave him a hassle but he stuck with it, put a little extra muscle in it and got it together. It wasn’t too long, well longer than most people would take, and he had all 4 snaps together. I told him to give me a high 10 and lavished on the praises. Really this is a big accomplishment, and we haven’t been doing anything to practice at home. Maybe they are working on it at school. We can be proud of unsnapping too, I guess. Turns out that the nuggets were really liked. J was in the beginning of a stomach bug, and he never eats well the night before he is going to throw up. He got up this morning at 6, got in bed with me and told me his tummy hurt. He started hacking and I got him out as fast as possible. When he got to the bathroom nothing really happened, bt he did have a fever. I set him up on the couch with a big bowl and some cartoons. Then it happened. And as soon as it was out of his system, he was better and himself. Today we were all suppose to walk in a local autism walk as a family. J and hubby stayed home while Little J and I walked. J was kinda mad b/c I had told him last night that we were doing something special today. When I left him this morning, I promised that if he didn’t throw up again, I’d take him somewhere fun tomorrow after church. Here’s hoping Little J doesn’t get this quick bug. So tonight I served up the left overs. He asked for honey instead of ranch and I obliged. We got some local honey last month to try and help desensitize us to desert allergies. (It is some of the best honey I have EVER had.) Well the nuggets and honey vanished in no time flat. Little J ate some more of his too. Another wheat free success.